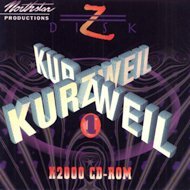 Northstar Productions Library for the Kurzweil K2000 is one of the finest libraries available. Brilliant stereo vocals, fat basses, rich strings, sparkling bells and excellent brass compliment any project need. Already used by the top names in the music industry, Northstar's sounds will put your K2000 in a different category. Many of the average 35 programs are furthered layered with the existing K2000 programs to expand the internal power of the machine. Vol. 1 focuses on classical and ethnic instruments; Vol. 2 focuses on pop, country, rap, and synthesizers. Each title is $195.